The HEDBIB database is a unique resource of references and publications on higher education systems, administration, planning, policy and evaluation from around the world. Links to electronic publications are provided where freely available. New higher education publications are identified by the IAU Information Centre monitoring team. References are also contributed by our partner organisations: UNESCO Headquarters, the UNESCO International Institute for Educational Planning (IIEP), Associació Catalana d'Universitats Públiques (ACUP), Universities South Africa, Southern African Regional Universities Association (SARUA), Union de Universidades de América Latina (UDUAL). The January 2019 edition of New in Hedbib has been published. New in Hedbib is a resource containing full references of newly entered publications into HEDBIB. Published five times a year, New in HEDBIB is divided into the IAU priority themes: The Role of Technology in Higher Education; Internationalization, Higher Education and Research for Sustainable Development; animages/iau/New%20In%20HEDBIB%20Janauary%202019(1).pdfd Values-Based Leadership; plus other themes. IAU priority themes are sub-divided by region. Each issue is supplemented by the IAU selection 'We Recommend', which provides a close-up of one or more publications. This bibliography has been produced to accompany the January 2018 issue of the IAU magazine IAU Horizons. It provides a selection of references of monographs, documents, reports and periodical articles over the last four years, from 2014 to date. This bibliography has been produced to accompany the May 2017 issue of the IAU magazine IAU Horizons. It provides a selection of references of monographs, documents, reports and periodical articles over the last five years, from 2012 to date. Access to full text articles available to IAU Members using HEDBIB Member login. 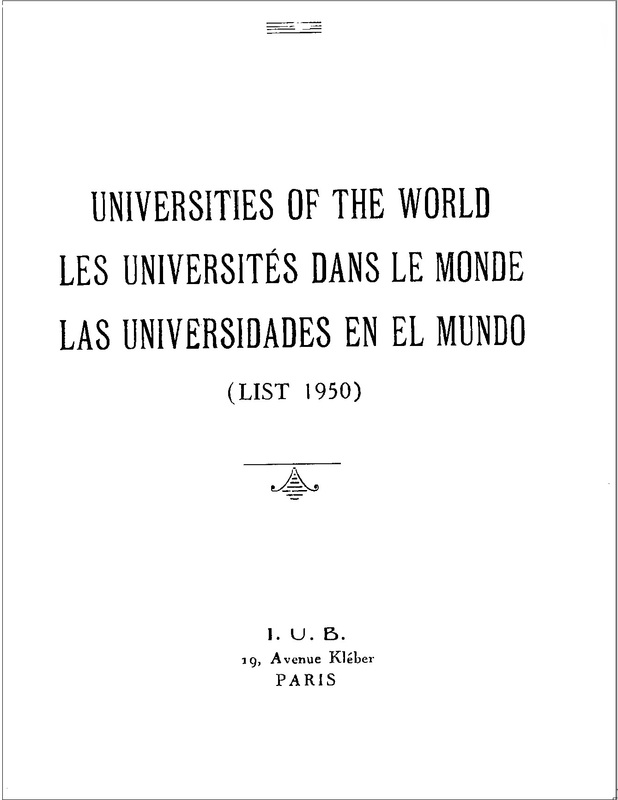 The first edition of the Universities of the World was published in 1950 in conjunction with the founding conference of the IAU which took place in Nice, France. 620 universities are listed in 73 countries and for each university figures are provided for the number of students enrolled. 64 years later, the world of higher education has changed enormously. Reflecting these changes, the 2014 edition of the International Handbook of Universities (first published in 1959 and now in its 26th edition) contains information on some 18,000 institutions in 180 countries. September 2014 saw the launch of the latest IAU reference tool on higher education, the IAU World Higher Education Database (WHED) Portal www.whed.net. The Portal provides up-to-date information on higher education systems, institutions and credentials in an ever-evolving world of higher education. Use this HEDBIB light guide to find tips for searching the HEDBIB database. More detailed instructions can be found in the "Guide" button below the search from.